A three-sided piece of land with a base on New Avon, one side on Old Avon and the third open to the Ham. It measured about 1 ½ acres and has steadily decreased in size over the years; 1a. 3r. 6p. in 1791; 1a. 2r. 21p. in 1850, 1a. 2r. 2p. in 1894. Today (1987) it is completely built over. The name has been in current use since at least 1791 but is not noted in earlier surveys. It may be that it is the Common Acre known in 1632 but missing from the 1791 records. This suggestion is based only on the use to which it has been put, mainly to public use. This small plot has been extensively used for centuries. A slight rise in ground level, possibly man-made, and the quay encouraged building to cater to the trade. Circumstances dictated tall, narrow buildings which were mainly 18th century brick. Whether there were earlier, timber-frames, is not known. Crossing Quay Bridge, the first building on the left was a large warehouse, approximately 80 x 75 sq. ft., the one mentioned in the 1863 minute above. This was in the form of a hollow square with a gate opening on to the road. The Local Board of Health granted to Healings Ltd., on 3rd March 1873, a licence to clear this site and build a new warehouse on half of it, provided the base was set back one foot and the space so yielded dedicated to the public highway. This was done. Provision was made for two bridges across the road to link the mill and the warehouse, and a railway spur into the new part. A second warehouse was added in 1889 to fill the original site. No further expansion was possible on this site unless it was to be into the open Ham or by the acquisition of existing properties. These businesses on the Quay were of long standing and comprised, excluding the warehouse noted above, seven holdings, constructed of 18th century brick, possibly on earlier foundations and generally of uncertain early history. They were mainly warehouses for grain, coal, hay and stone, although there were two public houses which went under A series of names from 1770. There was also some residential use as is shown by the record of a birth to "Mrs. Rice, at the Quay". The last resident was Moses Coopey who moved out in 1934. This was about the time that Rice Ltd. ceased to trade. At this time all the properties on Knaves’ Acre were owned either by Rice or Healing. After Rice quit, Healing was the sole owner of all buildings. These were demolished in 1935 and in 1977, in two roughly equal stages. In the first step the old "Admiral Benbow" and two adjacent buildings were removed to allow alterations to the roadway and the construction of an extension to the 1873/89 warehouses. Progressively, construction covered the whole of the acre by 1987 but before that time there was much other use. Bathurst's Boat builders in said to have been founded in this town in 1847, with generations of occupation at the Hammocks it has been assumed that this is where they started. This is not so. In 1855 the Trustees of the Commons re-let a piece of the Knaves' acre to Charles Bathurst. It was described as a boat-building yard, dock and saw-pit. The inference is that this patch had been used for boat-building from 1847 and possibly earlier. After the boat business emigrated to the Hammocks the site was used as a rick-yard until built over in about 1930. An offer of £150 (another source says £250) for this rick-yard made in 1937 by Healings Ltd. was refused by the Town Council who demanded £2,000. 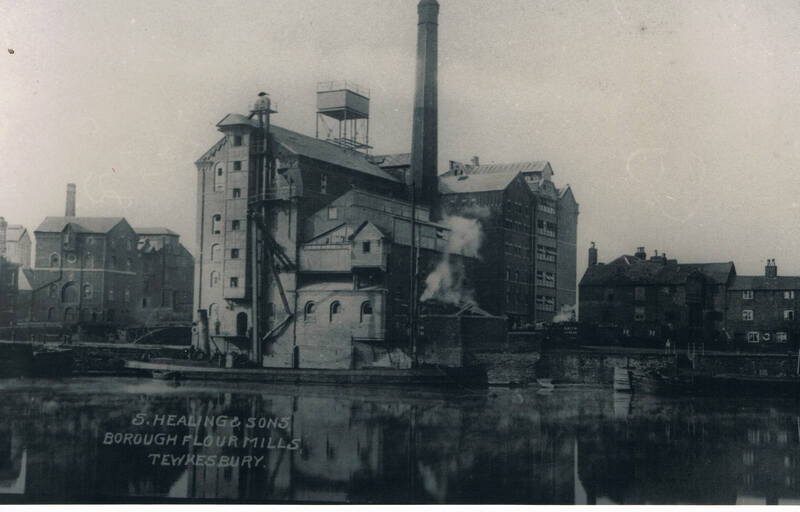 However, in 1946 the council council offered the same site to the mill for £50 (see appendix) For a further £50 it also offered the smaller piece on Old Avon which has caused so much public indignation when when it was filled in in 1872. Both were to be sold on condition they were metalled and/or tarmaced by the new owners. The reason for this was to eliminate the grass; no grass equalled no grazing which stopped any rights of common. As regards the sale of the smell piece on Old Avon it looks as though the 60 year. lease made in 1872 was now being belatedly replaced with outright purchase. It was 1949 before the sales were finalised due to bureaucratic delays and queries from the Ministry of Health. (see appendix). In the final reply some member or employee of the Council resorted to prevarication to bring the matter to a conclusion, stating that the difference in the areas to be sold as shown on different maps was due to the council taking them as one when agreeing to the sale, as they were adjacent plots. A glance at the map will show the truth of that statement. A second patch used for industry, in a limited sense, was the stone yard. This was a narrow strip of land alongside a ditch behind the quay buildings, open to the Ham and parallel to the highway. This was in use for storing stone brought by barge and used by the various local authorities for road repairs. The Local Board of Health rented it from 1850 for almost a hundred years and it had a history before that. It may be the site used for concrete fabrication in the 1930s. Other parts were used as landing stages and rick yards, all leased, usually for a maximum of 21 years as this was the most allowed by the act of 1808. (The 60years leases granted to Healings were for unenclosed lands). On Old Avon, immediately past the wagon stop the town built a childrens' bathing place. This was very popular in the 1930s and consisted of a series of wide, shallow steps descending into the river. Despite all this and the railway there remained some grass, some commoners’ rights, which caused many arguments, and still does. Notice was served by the Birmingham & Gloucester Railway upon the Trustees and the Dowdeswell Estate of intention to build a branch line from Ashchurch to the Quay, in 1836. The original intention was a single line, which was built down Quay Street, terminating in a turntable so that wagons could be moved to the edge of the quay at the slipway mentioned in the 1863 application. This involved the demolition of the whole of the south side of Quay Street and the building of a second bridge over Avon and proved inadequate on the quay. There is no indication that the turntable was ever installed. Instead twin track was laid in the quay itself to the end of the quay wall, to include a spur back into the new mill. Two indentures reflect this change. In the first, dated 10th May 1850, Dowdeswell leases 2r. 4p. for 21 years, for sidings to link with the quay. A second deed dated 23rd June 1850 gives a further lease for the same period of 2r. 8p, at the land adjoining the Ham. The first, for which £1 p.a. was paid, permitted the laying-down of twin track on the quay as far as the wagon-stop. The second allowed a larger spur from the west end of the first piece, out on to the Ham, terminating in double sidings down the bank of Mill Avon. Any trace of this was buried under dredger’s debris in 1937. That it was built seems certain from a news item of an untimely death caused by playing on railway wagons parked on the Ham in 1872. The The 0.S. map of 1884 does not show this line so it must have been removed when the lease expired after 1871. This is the time that the lease of the 2r. 4p. on the quay should have ended. Between 1871 and 1884 there is a blank. In the latter year there is mention of a conveyance between the railway and the Dowdeswell Estate, (Not seen) of land at the quay. This sale, for it must have been a sale, was not made known to the commoners and caused much correspondence between the solicitors representing both in the next century, (see appendix). The patch was approximately 1r. 22p. a cleaver-shaped piece between the quay wall on one side and Rice’s building on the other. It occupied half of the quay. On the southern edge of this patch was for many years a sleeper-built shed set at the acute angle to the quay wall taken by the line to the sidings on the Ham. Some re-arrangement of the track on the quay took place in 1872 to correspond with the filling in of the slip noted above. A different switching arrangement, and two new spurs, one over the filled-in slip and one into the new warehouse. The lines of the latter were uncovered in 1977 during alterations to the building. By this time the tracks had been long disused. 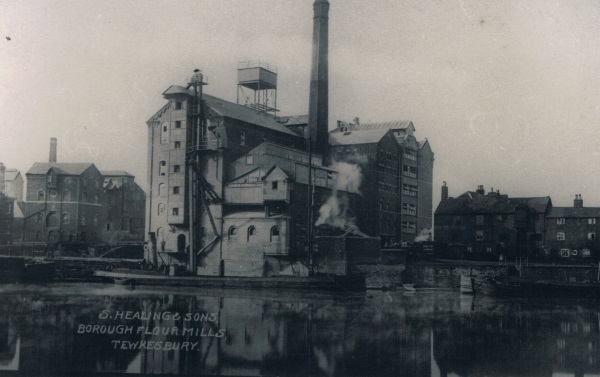 In 1869 both Rice and Healing had working mills and warehouses at the quay and in Mill Street. There was a lot of traffic between the sites, to facilitate which a light railway was in operation across the Ham, known in 1869. No trace of this remains. To whom did Knave’s Acre belong? Quite a lot of people, successively and simultaneously. Before the enclosure of 1803 it was part of the Severn Ham and so belonged to whoever owned Warwick’s Lands. The freehold belonged to General Dowdeswell in 1825. But that was only the land. Where there was grass the commoners had rights for half of the year. Again, there was the highway which crossed the length of the acre, and the quay. After 1850 the railway first leased then purchased a piece. Ownership was a legal jig-saw with legal and illegal pieces. It followed a twisted path which can only be appreciated by a legal mind. To hold in fee simple is an unambiguous legal statement which defines defines the position of General Dowdeswell in 1825.It is supposed to define the position of William Dowdeswell in 1868 tut ft his death in 1894 he was stated not to be the owner, merely to hold a life interest in the estate. In the C.R.O. is a confusing document whose content is as complex as its reference - LR78l63- 94AD1893-4928. After 1894 the technicalities ramble on, and over 50 years after after the sale of the estate trustees continue to administer and perpetuate themselves. In 1948 one lived as far away away as the Orkneys. Rice & Co. gradually acquired all the remaining buildings on the quay with the exception of the old "Admiral Benbow". From the report made in 1893 they also acquired bits of Knaves’ acre. The pub was owned by Healings Ltd. but was unsuitable for further development as it was isolated from the main buildings by the highway. For how this was resolved see under "Rights of Way." as noted above, the remaining buildings eventually passed to Healings Ltd.
How the Dowdeswell position altered is detailed under "Commons". Here it is needful only to say that in 1932, when the estate was auctioned the only interest held was a halfshare in the rents of various pieces and that was all that was and could be sold. The Town Council bought this moiety together with all other parts of the Ham up for sale in 1932. They purchased no land in Knaves' acre. It follows that they could not sell any, but they did, as is shown below. The railway’s holdings seem to have been sold to the mill in or about 1965. Between that piece and Key Bridge, bounded by the quay and the quay buildings, is about one rood of land for which no evidence of sale or lease has yet been produced.